We are aware that while the planet is under going a shift to a higher frequency that, because she is a living moving energy system, all who reside within her energy fields will also experience this realignment. 1. First level – when the body drops density it commonly displays mutational symptoms of flu, headaches, diarrhea, rashes, muscle and joint aches. 2. Second level – the etheric blueprint floods with light and releases karmic experiences, individuals may feel disoriented as well as experience of ’bouts of flu’. Many begin to question “why am I here”. 3. Third level – physical senses become much stronger. Your bodies not only absorb Light for its own change but also acts as a transducer – decoder of higher light energies to the planet as a whole. 4. Fourth level – major changes are in the brain and its chemistry and electromagnetic energies – symptoms are often headaches, blurry vision, loss of hearing and sometimes chest pains. 5. Fifth level – the mental body decides to tune to spirit, dreams change and may become more ‘lucid’, you get feelings of deja vu. Thought processes become non linear. Being’s oscillate between knowing and doubt. 6. Sixth level – we draw to us others for mutual support and stimulation of growth. We question what is real, our mental process and how we identify with others and ourselves changes rapidly. 7. Seventh level – the heart chakra opens more, we become more ‘real’ with other emotions, we just have to be ourselves! We release blocks and old patterns – it is a time of great emotional clearing and great intensity as we seek to rid ourselves of emotional baggage. Many wish to ‘ascend‘ and leave the planet as we sense the very real possibility of ascension through our deepening connection with spirit. 8. Eighth level – we see the Master in all and purely wish to be of service – we leave the ‘saving and rescuing’ mode behind in favor of the desire to serve Divine Will. The brain is being activated – particularly the cerebrum, the ‘sleeping giant’. Cranial expansion is common; triangular ‘seed crystals‘ in the brow and recorder crystals in the right side of the brain are activated along with the 8th, 9th and 10th chakras. The pituitary and pineal glands are opened fully and work together to create the ‘Arc of the Covenant‘, a rainbow light that arcs over the top of the head to the third eye that is a decoding mechanism for higher dimensional language. 9. Ninth level – decoding geometries and toning is easier, spirit is using the languages of light which shift the 6th dimensional blueprint into a new template for your 5th dimensional Lightbody. 10. Tenth level – you are one with Source consciousness and know all is possible. DNA is no longer 2 strand but 12 strand; teleportation, manifestation etc. are instantaneous. The Merkabah (another name for our Light body) has been built and allows you to pass through space, time and dimensions complete in your totality. 11. 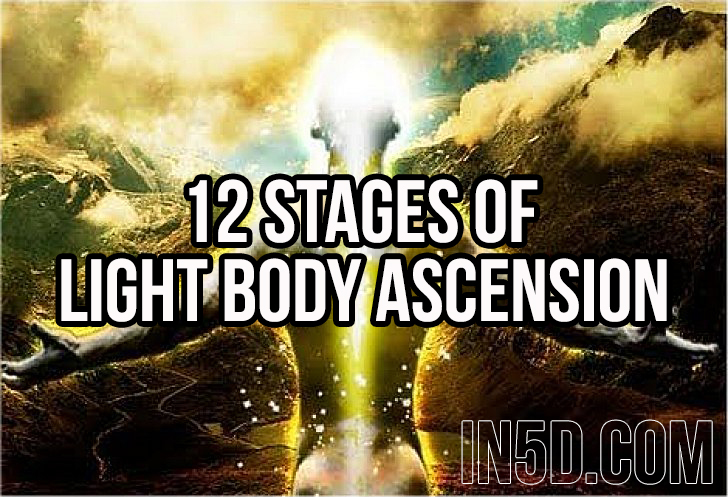 Eleventh level – all levels of the lightbody have been constructed and activated and are connected to your physical body via ‘spin points’. These light matrix’s lie along the physical acupuncture meridians and are lines of light intersecting in beautiful geometries – a new 5th dimensional circulatory system of Light. All have received specialist training and skills to help create and manifest the New World – the ‘Golden Age‘. 12. Twelfth level –the continuation of the Creation and implementation of the New World systems – hook up with other 12th level initiates who bring into existence new governments, new financial and educational systems, better system of food and resource allocation etc. as all will be redefined in the final stages of Earth’s ascension so that all may exist in joy, equality and harmony.